Daniel Ricciardo had one hell of a tough time at Formula One’s season opener in Melbourne, Australia this past weekend. 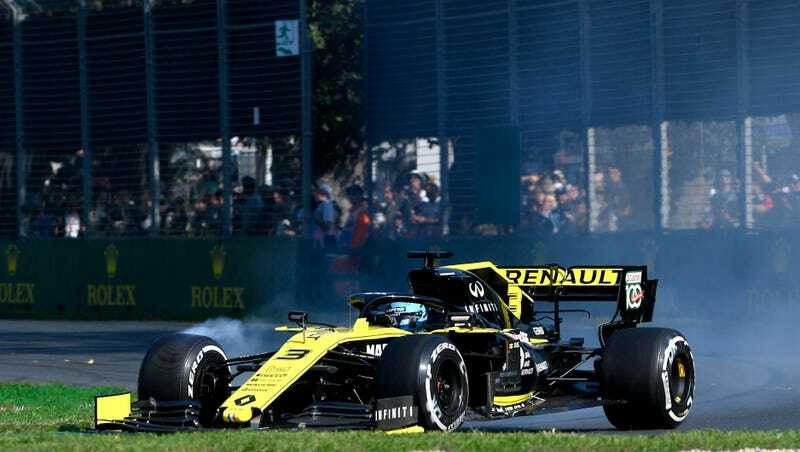 On his new team debut with Renault and in his home country, he qualified 12th, only to completely destroy his front wing mere seconds after the race had started. This led to an early retirement, Ricciardo’s third such outcome in Australia in his nine-year F1 career. What the hell makes that particular weekend so tough for Ricciardo? According to the Australian, part of it was his hectic promotional schedule. Ricciardo clarified that he wasn’t trying to throw his PR team under the bus for overloading him—just that he didn’t vocalize how exhausted he was or factor in time for race prep. He had a Renault film day on Tuesday, drove Rick Kelly’s Supercar and had an F1 Live event on Wednesday, and tons of sponsor appearances as both an F1 driver and a member of the Confederation of Australian Motor Sport throughout the weekend. Oh yeah, and there was that little race that happened on Sunday, too. It’s tough. I feel like the whole week we’re... this week is a tough one. We’re always pushing uphill. You can never do enough, but I feel we do more than enough. I don’t want to blame that, but I certainly didn’t... I don’t know, I feel flat for more reason than one. It’s a tough break for Ricciardo—the first race of the year serves to set the tone for how you approach the rest of the season. For him, the Australian GP was also going to set the tone for his appearance on a brand new team, and on his home turf. It’s fair to say that nothing went according to plan for the Australian driver. The best he can do is work hard to prove himself for the rest of the year.